When we first started talking about our Easter holiday this year I thought we were going to end up going to Snowdonia. Me being me however we left booking a little late and I couldn’t find anything I liked that was available over the Easter weekend. Anyone that followed me on Instagram in February time may remember the weekend I seemingly looked at every single self-catered cottage in the whole country! We had talked about the Lake District before and I stumbled upon a gem of a place which happened to be free. The house we stayed in was Kirkbank, a converted Chapel in the small village of Eskdale in the Western Lake District. The house stood out as it was very high tech with a boiling water tap, grand piano and… an outside bath. Eskdale is very remote and perhaps not everyone’s choice but it was lovely for us – plus pretty much everywhere in the Lakes is a good drive away anyway! The first thing that strikes you as an Easterner when you arrive in the Lakes is how overwhelmingly beautiful the scenery is. I am a massive advocate of stunning Suffolk but its beauty is rather more subtle than the dramatic fells and massive bodies of water you will find in Cumbria. There were sheep everywhere and some of the roads were more than a little scary those of a nervous disposition bring an extra pair of pants. You can also drive miles and miles and not see any sign of civilisation. I am used to being ‘remote’ having grown up on a farm in a small village but this was something else. The terrain means you can’t drive as the crow flies and the narrow roads can be tricky for those of us not used to it, but after a few days you feel like a local. When you’ve driven 6 hours all you want to do is flop on the sofa and you’d have no problems here – just stick on the underfloor heating – or light the fire if you feeling brave – make a cuppa with the Quooker tap and have a little nap. That’s what I would have done… but then I saw the bath – I have a bit of a thing for them but the one in the main bathroom had a TV so I didn’t even miss Corrie. But that’s enough about the house, you can find out all you need to on the link. As I’ve said the Lake District is massive and even places that look close on the map turn out to be hours apart but we managed to cover some serious ground. 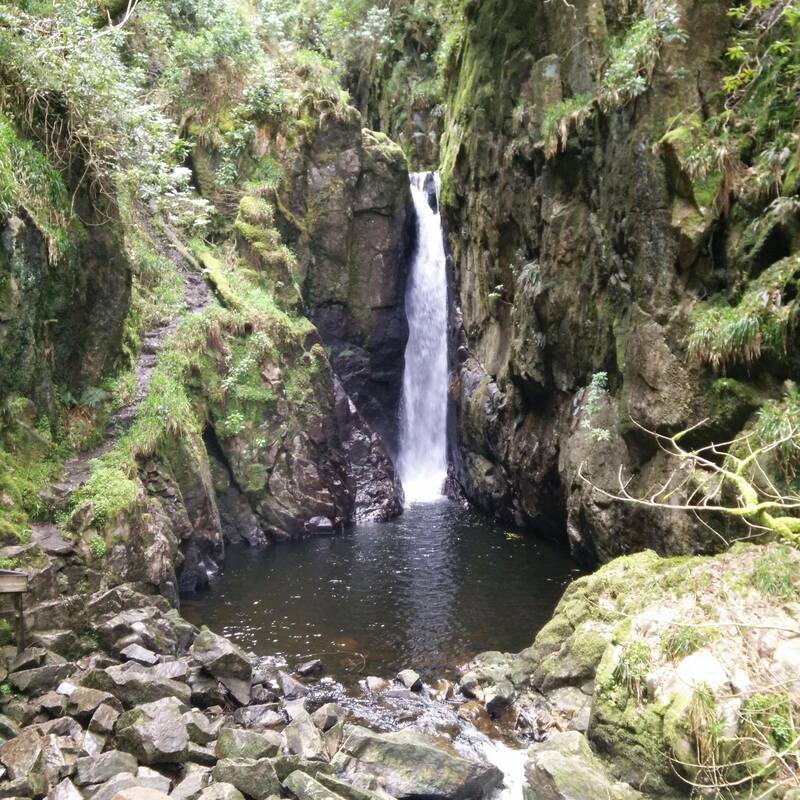 One of our favourite things was Stanley Ghyll Force, a short drive or longer walk from Eskdale. My main must haves from a holiday are views and nice walks and this had both. It’s hard to show in this photo but this is taken from up high after a semi-challenging walk up. The moisture from the falls cools you down! It’s not something I’ve seen before and you truly feel like you’ve stumbled into a different country. The walk starts from the Dalegarth station car park, on the Ravenglass and Eskdale railway, which is well worth a visit even if you don’t use the train (ratty) itself. We had planned to try out the ratty but it’s a not a particularly cost effective mode of transport, though I’m sure kids would love it! The other thing I really enjoyed on this holiday was wild swimming. You know when people say ‘all the gear and no idea’ well that was us, dressed up in wetsuits, those little water shoes and everything. 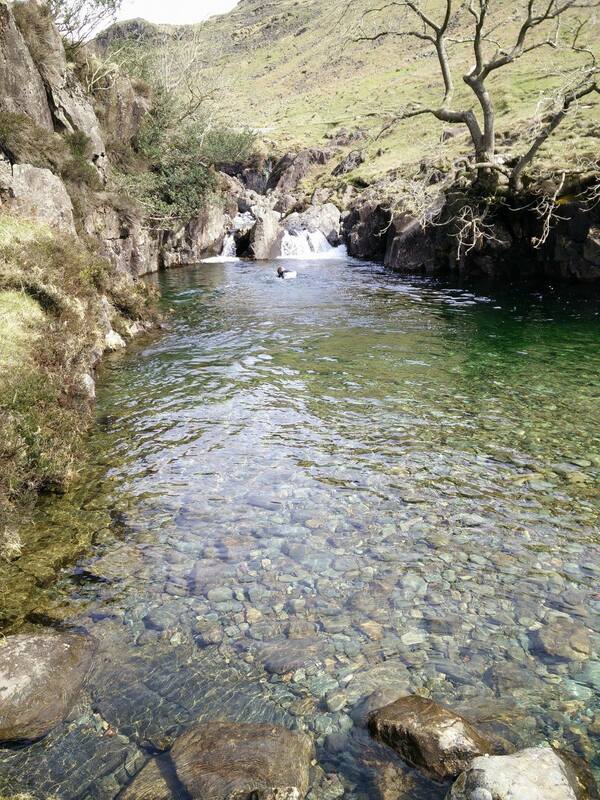 The wild swimming pool is called Tongue Pot, it has crystal clear waters and is like something out of Game of Thrones. But I tell you what, it was bloody freezing, it was a warm and sunny April day and I knew it would be cold but I was expecting Walton-on-the-Naze cold not carving ice in Antarctica cold. I have a lot of respect for Mike, he managed to get in and make a good go of it while I stood around screaming, there was a little bit of swimming though I promise. The foot path comes right over the top of the pool though and we must have heard ‘you’re brave!’ about 20 times but sitting there sipping steaming tea from our flask while watching Mike swim under a waterfall I couldn’t have been happier. I highly recommend it to anyone visiting the Lakes, it’s worth making a trip for and is regarded as one of the best places for wild swimming in the the Lake District. Hired a boat on Windermere – a bit touristy but for £33 for an hour you can’t really go wrong, plus as hiring a boat on holiday seems to have become our ‘thing’ it needed to be done. I did get beeped by a cruiser! Keswick and Derwent Water. Keswick is a beautiful little town and Booths is worth a visit in itself! Wastwater. A beautiful lesser known lake, very near to Eskdale and the deepest of all the Lakes. Probably my favourite as it’s so peaceful, the perfect place for a a quiet picnic – even in the school holidays! So all in all if you are looking for a peaceful and scenic holiday but also are a confident driver who doesn’t mind spending time in the car if you want to venture further afield then the Lakes is definitely for you. Below are a selection of photos from our trip, I hope they convey a small of slice of our the natural beauty of the Lakes.